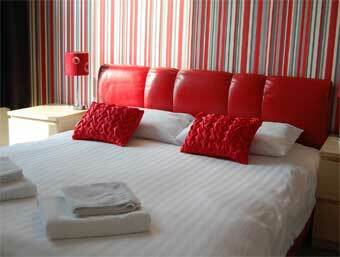 The Bromley Hotel has six sea-view rooms with stunning views of Blackpool's famous North Pier. There's also a suite on the ground floor with a lounge area overlooking the beach. Located half-way between Blackpool's North Shore Golf Club and the resort's iconic Tower, this 14 bedroom hotel enjoys a splendid position on the promenade and is very reasonably priced. The Pleasant Street tram terminal is just 50 yards away making trips to Blackpool Pleasure Beach, South Pier and the Illuminations an absolute doddle. The Winter Gardens and the Opera House are also just a 5 minute walk. Each of the rooms at this four-star bed & breakfast is decorated to a very high standard indeed - in fact there's something of a boutique atmosphere and approach. The colour-schemes are rich and vibrant, the furnishings top-quality and much consideration has been made to the use of space. Terrific selection of room types including a ground-floor twin, a sea-view 'Super King' double, a Quad Family room, a sea view family double, and a sea view king sized bedroom. All rooms are en suite. Room perks that include Flat screen televsion with combo DVD, Tea and coffee making facilities and Crisp white Egyptian cotton bed sheets. Some fabulous views of the Irish Sea and Blackpool's famous North Pier. 9 private parking spaces at the rear of the hotel. 4-star AA rating guaranteeing quality of service. Licensed Bromley bar and restaurant. Full English/continental breakfasts with plenty fresh fruit, cereal and yoghurts. Served daily between 8:30 - 09:30am.